The consolidation of powdering porous limestone with ammonium oxalate treatment is hereby being examined through its performance in the field. The literature to date reports this treatment’s potential use for consolidation and protection (from acid attack), while still retaining the water transport properties and supporting compatibility. This inspired a long-term research project which started in the laboratory and progressed to real buildings with a specific focus on the interactions in the stone taking place between the treatment and salt mixtures that may be present on site. 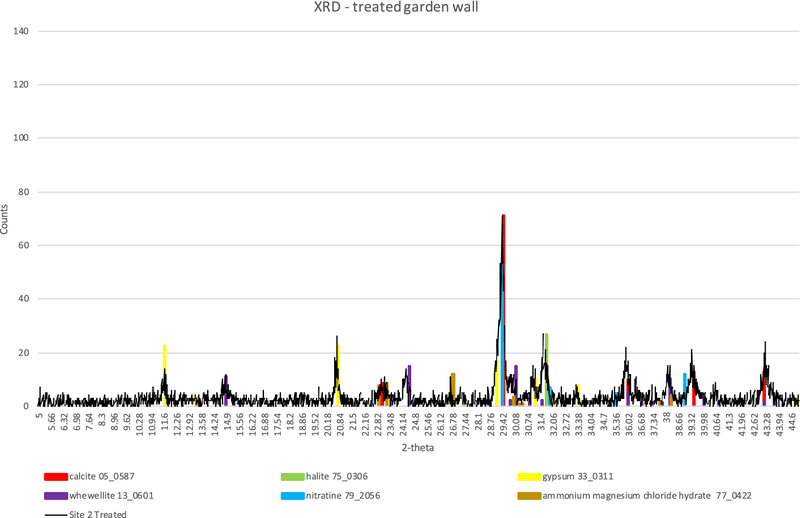 This study focuses on the outcomes following a 24-h application of a 5% ammonium oxalate poultice on a historical soil-retaining wall located in a seventeenth century garden. In this case, besides calcium oxalate, the by-product formation of ammonium magnesium chloride was detected through X-Ray Diffraction (XRD). This is a first-time reported finding, which is important to consider within the environmental context of built heritage and ammonium oxalate treatment. The subject of consolidation forms the basis of this research study where solutions for the mitigation of powdering limestone were considered. Stones which form part of a building or monument on site with this type of deterioration present a particular problem where replacement is unjustified and no intervention objectionable, especially when seen in light of a holistic conservation project. The desirable intervention in this case would call for a reduction in powdering through consolidation of the loose grains to each other and to the parent stone beneath while also slowing down further damage. This would need to be achieved in the presence of naturally-occurring salt mixtures, while still retaining the various properties of the stone including visual, physical and chemical aspects. The limestone studied in this research is Maltese Globigerina Limestone, the main constituent material of the rich architectural heritage in the Mediterranean Islands of Malta and Gozo located 93 km to Sicily’s south and 288 km to Africa’s north. Globigerina Limestone is a fine-grained stone which is chiefly composed of calcium carbonate in the form of calcite crystals which are cemented together by micrite . This limestone weathers readily in a salt-laden environment with powdering forming one of the main deterioration manifestations. The material has a high porosity that has been reported to vary between 24%  and 41% , with a pore size distribution where the majority of pores ≤ 4 μm . Further testing on quarry Globigerina Limestone in the initial stages of this research project showed that the porosity accessible to water was 21.36% and the ratio of mesopores (6 nm < Ø < 50 nm) to macropores (Ø > 50 nm) was 1:7 . The chemical reaction between ammonium oxalate and calcium carbonate to form calcium oxalate is the premise on which this treatment is based. When naturally-formed calcium oxalate patinas on stone first started being investigated at the Opificio delle Pietre Dure in Florence, Italy in 1985, these were found to have improved acid resistance properties . The potential formation of calcium oxalate through artificial means was later investigated . This was developed using ammonium oxalate and marked the beginning of ammonium oxalate treatment in stone conservation. Consolidation properties were also subsequently reported . Further studies were taken up on different marbles and limestones [8–13] including Maltese Globigerina Limestone . Continued research on ammonium oxalate treatment to Globigerina Limestone was reported to result in the formation of calcium oxalate as whewellite which had a consolidating action, increased the surface hardness and retained the water transport properties of the stone . The potential benefits of this treatment initiated this research project and commenced with the application of the treatment in the presence of a single salt—sodium chloride—in the laboratory, under controlled conditions [16–18]. This study also included different weathering typologies—quarry and weathered stone. The next step in the research led to the inclusion of further single soluble salts—sodium sulfate and sodium nitrate—which were studied immediately after treatment as well as after a fixed duration of 1 year’s site exposure on parallel sample sets [19–21]. No deleterious by-products were detected when the treatment was applied on the presence of these salts. Conclusions from this research highlighted the potential benefits of the treatment together with the need for treatment and testing in the field on real buildings in the presence of salt mixtures and fluctuating environments. These studies led to the large-scale project under discussion which took in three different architectural heritage building sites where three representative environments were chosen: marine [22, 23], urban and garden settings in which the predominant salt present was envisaged to be different in each case, albeit within mixes. Ammonium oxalate treatment was applied without any desalination, in order to evaluate the resulting outcomes for each case scenario. A coastal bastion was selected to represent the marine environment, where the salt mixture included sodium chloride and sodium nitrate and did not contribute towards the formation of any adverse by-products  such as sodium oxalate which has been considered to be a potential by-product . Similarly, no unfavourable by-products were formed when the treatment was applied to the urban site which consisted of a church, situated in a heavily polluted urban environment and included gypsum (Dreyfuss in preparation). 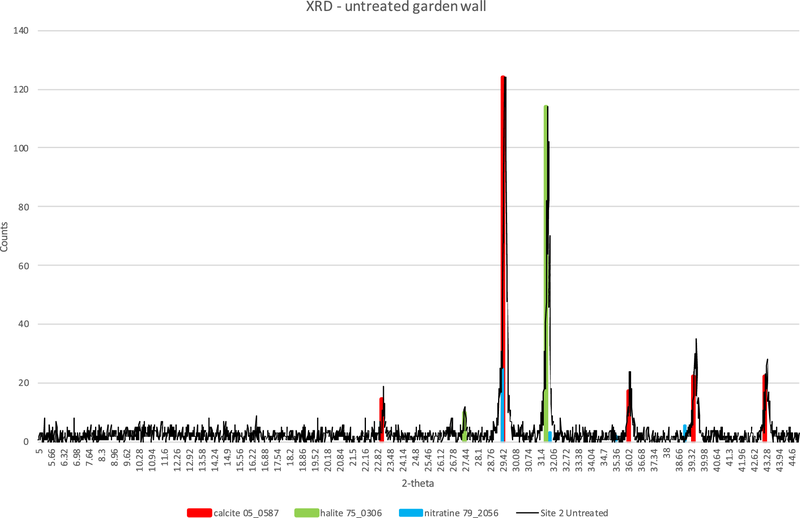 This paper deals with the garden site where for the first time, a new by-product was formed after ammonium oxalate treatment. 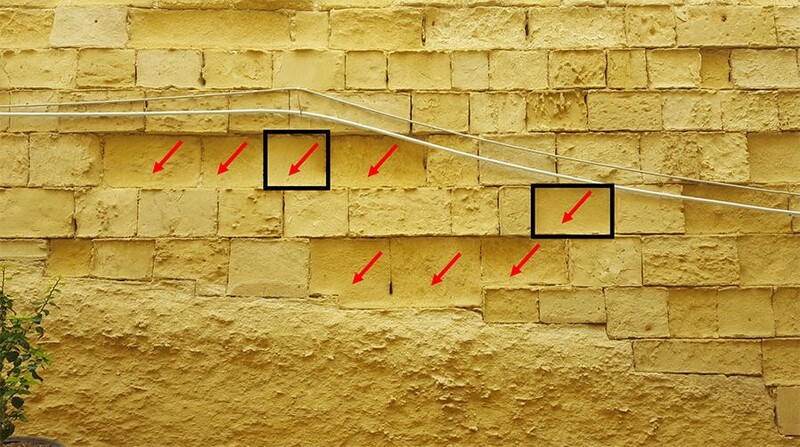 By-products—namely newly-formed soluble salts—are crucial to consider in the context of historic porous limestone on site, where water is available in its various forms—rainfall, rising damp, moisture from the air—and plays a key role in the salt crystallization and re-precipitation cycles which promote the deterioration of the stone fabric. The aesthetic considerations, consolidating effects and water transport properties following ammonium oxalate treatment on this site are discussed elsewhere (Dreyfuss in preparation) and not the focus of this paper here. St Philip’s Garden was built within St Philip’s Bastion as a private garden by Grand Master Jean Paul Lascaris , who led the Knights of St. John in Malta between 1636 and 1657. It is constructed on a ravelin (triangular bastion), laid out over numerous terraces at varying levels, connected by pathways, steps and ramps which culminate at the Wignacourt Fountain which the garden is best known for. In 1932, the garden was included in the Antiquities Protection List and later scheduled by the Malta Environment and Planning Authority (MEPA) as a Grade 1 national monument in 2009 . Today, it is a public garden. Conservation works at the garden commenced in 2017. The garden wall chosen for this study was scheduled to be conserved in the later stages of the project. In this way, the study could serve an additional diagnostic as well as research and didactic purpose. The characterisation, treatment and testing discussed in this paper were all carried out before the start of any intervention works. The garden wall considered in this research is approximately 5 m high and sits on a natural rock outcrop. It is accessible through the internal ramped passageway located within the garden confines (Fig. 1). Both the wall and the rock outcrop are composed of Maltese Globigerina Limestone. The wall is a retaining one which serves to hold the earth and soil located immediately behind it. This wall was selected because of the high incidence of powdering stones which were scheduled for replacement in the future intervention project. 8 stones—indicated with the red arrows in Fig. 2—were characterised as described in “Stone characterization” section below, followed by treatment and testing of the selected stones—enclosed by the black rectangles in Fig. 2, left untreated and right treated—as described in “Treatment” and “Testing methodology” sections. The stones assigned to the research study—8 stones measuring approximately 30 cm high with a varying width from 35 to 55 cm—were evaluated for uniformity starting with visual observations, where all the stones were found to be exhibiting powdering. In addition to visual observations, a full photographic survey was also carried out. Characterization of the soluble salts present in the stone included Ion Chromatography (IC) in accordance with UNI EN 16455-2014 using a Dionex DX100 which was performed on extracted core samples approximately 2 cm in diameter by 2 cm deep. Characterization of the stones also included colorimetric analyses using a Konica Minolta spectrophotometer CM-700d, with the standard illuminant D65, observer 10°, target Ø = 8 mm (EN 15886.2010). This was followed by hardness characterization where a Drilling Resistance Measurement Systems (DRMS) was employed, using a 5 mm diamond-end drill bit at a penetration rate of 20 mm/min and 300 revs/s. These two tests allowed for the selection of similar stones in terms of colour and hardness to represent the untreated and treated samples in the study. These results are based on three separate tests on different parts of the same stone. The colour difference between stone to be treated and stone to be left untreated was calculated at delta E = 0.60 ± 0.44, while the drilling resistances were measured at 4.40 ± 0.54 N (stone to be left untreated) and 4.22 ± 0.83 N (stone to be treated). These results allowed a baseline to be established where untreated and treated stone could be directly compared so as to allow for the effects of the treatment to be independently highlighted. The selected stones, including those designated to remain untreated as well as those intended for intervention were first lightly dusted using a dry, soft nylon brush. This procedure is representative of what happens in real restoration projects, where part of the stone cleaning process involves dry brushing with nylon/vegetable fibre brushes to remove superficial deposits and/or soft concretions. Treatment was then applied in a cellulose pulp (300 μm) and consisted of a 5% ammonium oxalate monohydrate solution utilising deionised water as per established procedure . This poultice was applied for a 24-h contact time so as to facilitate application practicality and removal logistics on site. This protocol, based on previous research in the laboratory , has already been adopted in previous studies using ammonium oxalate treatment on site [22, 23] and is being used again here for comparison purposes. The poultice was applied at an approximate height of 3.0 m above ground level with a mean ambient temperature during application of 26.48 °C and a mean relative humidity of 66.60%. The poultice was left uncovered and was manually removed after 24 h (conditions during 24 h were 25.77–33.69 °C temperature and 45.11–75.91% relative humidity), at which time the poultice was still damp. Excess pulp on the stone’s surface was brushed off with a dry, soft nylon brush and the stone left to air-dry for a period of 5 days at ambient conditions (conditions during 5 days were 24.63–39.92 °C temperature and 30.35–83.92% relative humidity) prior to the extraction of cores for subsequent laboratory testing. Three separate cores were extracted for each of the tests described in “Testing methodology” section below, both for untreated stone as well as for treated stone. The cores were extracted from untreated and ammonium oxalate treated stones for laboratory testing. The cores measured 2 cm in diameter and were approximately 2 cm deep. These cores were extracted dry so as to prevent any disturbance in the salt content of the samples. After extraction, the cores were oven-dried at 60 °C for 24 h and then cooled to room temperature. X-Ray Diffraction (XRD) testing utilised a Bruker D8 Advance XRD (s/n: 00-07-233) to analyse the sample surface. The 2-theta angle measurement range investigated was 5° to 45° and the scan rate included a step size of 0.02° at 1.5 s per step. The resulting diffraction patterns were evaluated through the instrument’s database EVA DIFFRAC plus Basic, Reference D+B200009, Version D+B199909, to determine the mineral phases present in the samples. IC was also carried out on cores from treated areas for direct comparison with the results from the IC carried out on the cores form untreated stone at characterization stage (“Stone characterization” section), in accordance with UNI EN 16455-2014 using a Dionex DX100. All testing included three runs, where each test was carried out on three different cores for each sample type—untreated and treated. Besides calcite, the diffractogram for untreated stone in Fig. 3 demonstrates the clear presence of halite together with the possibility of nitratine at the surface of untreated stone. No other phases were detected at the surface. Although the site is not located on the shoreline, it is nonetheless still very close to the sea—375 m. This extended marine environment is thought to account for the origin of the halite present on the stone’s surface. The source of the nitratine is considered to be the soil which is located directed behind the wall and which probably contained fertilizer where the incidence of nitratine is common. The diffractogram for treated stone is illustrated in Fig. 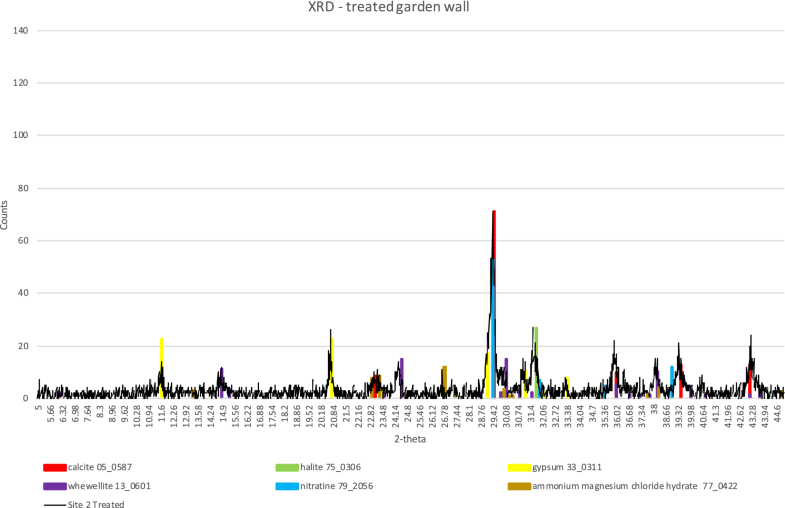 4 and shows the presence of new mineral phases when compared to the diffractogram for untreated stone in Fig. 3. Calcite was still the predominant mineral phase present and the incidence of both halite and nitratine remained clear. The newly formed mineral whewellite was also detected, which is the desired end product with ammonium oxalate treatment. Gypsum, not identified at the surface of untreated stone (Fig. 3), was clearly present in the diffractogram for treated stone (Fig. 4). This new phase after treatment, at the surface of the stone is thought to have been brought about by the poulticing action of the treatment which mobilised the gypsum towards the surface from its previously sub-surface location within the stone. The incidence of gypsum is not considered to be a by-product of ammonium oxalate treatment but rather a pre-existing mineral within the stone’s depth and which was mobilised during treatment. Further research on the pore size distributions involved is currently being investigated. On the other hand, the phase identified as ammonium magnesium chloride in Fig. 4 is considered to be a by-product of ammonium oxalate treatment. It is hypothesised that during treatment, the ammonium from the treatment reacted with magnesium chloride, present within the stone’s depth and mobilised by the treatment poultice, to form ammonium magnesium chloride. Although magnesium chloride was not detected at the surface of the untreated samples (Fig. 3), the presence of both magnesium and chloride ions within the stone’s depth are both confirmed through the IC results (Table 1). Both the gypsum and the magnesium chloride present within the stone’s depth are considered to originate from the contact soil located directly behind the wall. As in the case of nitratine, gypsum is also reported to be used in agriculture where gypsum is added to contribute towards providing a calcium source , and to control the pH of the soil . Similarly, the magnesium source is also possibly soil fertiliser where magnesium sulfate among other magnesium salt types is used to counteract a magnesium deficiency . Ammonium magnesium chloride is an uncommon salt, and was reported to be found in a rare case on three Greek ceramics at the Metropolitan Museum of Art where it was concluded that this salt was a result of an earlier cleaning intervention which utilised hydrochloric acid followed by ammonia . This new finding involving the formation of a new soluble salt, as a result of ammonium oxalate treatment is important in the context of using this treatment in the field, on real buildings and monuments, where salt mixtures are inevitably always present, and where desalination may not be possible or desirable. The potential adverse side-effects of this new soluble salt formation, 17 g/100 g H20 at 20 °C , is a different outcome which has opened up a new line of enquiry worth investigating and merits further research. While the testing carried out in the XRD looked at the surface of the stone, the IC analysis considered the ions present within the stone, up to a depth of 2 cm. The cations and anions for both untreated and treated stone are presented in Table 1 below (milliequivalent per gram). 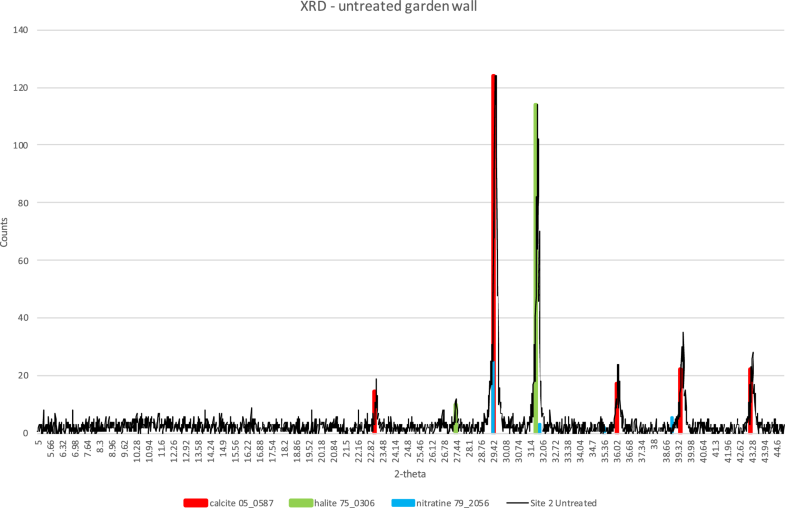 The presence of sodium, chloride and nitrate ions corroborate the minerals identified in the XRD diffractograms where halite and nitratine were identified. Other ions identified in the IC analysis including calcium, magnesium, potassium, ammonium and sulfate, suggest that additional soluble salts are present within the stone’s depth further below the surface. The ions in the treated stone obtained from the IC investigations in Table 1 are similar to those in the untreated stone except for the ammonium ions which are seen to increase by almost 800% after treatment. Although an ammonium salt was probably present in the stone before treatment, as evidenced by the presence of the ammonium ion in the IC results for untreated samples, this stark difference is thought to be the result of a reaction between the ammonium from the ammonium oxalate treatment and a cation present in the stone during treatment. However, in this case, the results indicate that the ammonium did not transform to ammonia and evaporate, or at least, not in its totality. Ammonium oxalate treatment was applied to powdering limestone on site in the presence of natural salt mixtures. These salts included sodium chloride and sodium nitrate at the surface of the stone where the treatment was applied, and other salts which were located below the surface of the stone within the top 2 cm, including gypsum and magnesium chloride. The ammonium oxalate poultice treatment resulted in a salt redistribution within the stone where the sub-surface salts were mobilised towards the surface as a result of the poulticing action during treatment. It was concluded that the ammonium from the treatment did not completely transform into ammonia and evaporate, as expected from the ammonium oxalate treatment mechanism, but instead reacted, at least partially, with magnesium chloride which was present within the stone, to form a new by-product in the form a new soluble salt, ammonium magnesium chloride. The presence of soluble salts in historic porous limestone which is exposed in the natural environment is of great importance due to their contribution to the stone’s deterioration during their crystallization/dissolution cycles within the pore network of the material fabric. This new outcome provides an important contribution towards the further understanding of the performance of ammonium oxalate treatment in context, on porous calcareous stone in situ where salt mixtures are always present. The research contained in this article is the exclusive postdoctoral work of the author. The author read and approved the final manuscript. 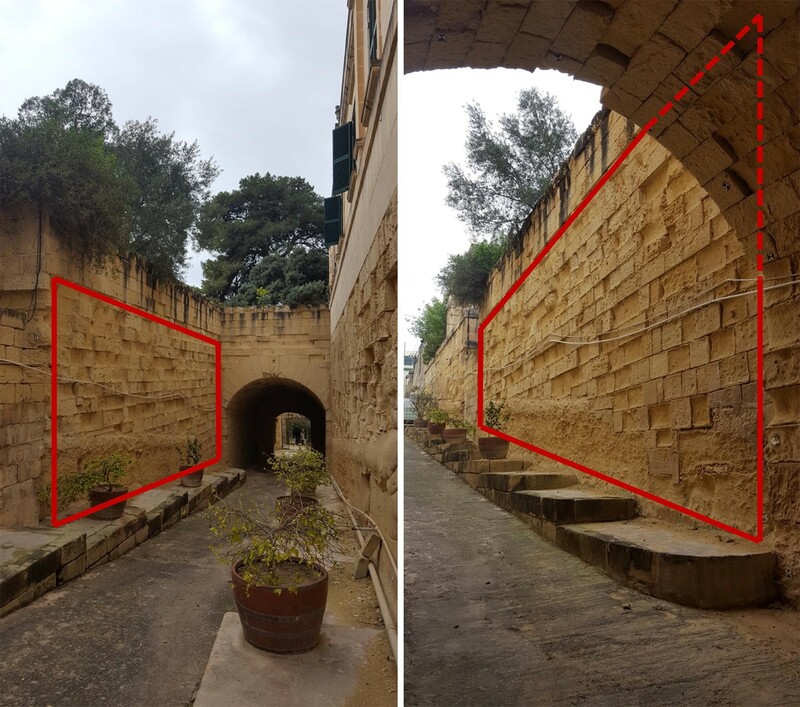 This research project is mentored by Professor JoAnn Cassar, Head of Department of Conservation and Built Heritage, Faculty for the Built Environment, University of Malta. The site studied, St. Philip’s Garden, Floriana, Malta, was made available for research by the Restoration Directorate, within the Government of Malta. XRD investigations were carried out at the Department of Metallurgy and Materials Engineering, Faculty of Engineering, University of Malta under the direction of Ing. J. Camilleri and using equipment funded under ERDF (Malta) through the project: ‘‘Developing an Interdisciplinary Material Testing and Rapid Prototyping R&D Facility (Ref. no. 012)’’. IC analysis was carried out at Artelab s.r.l., via Federico Nansen, 102-00154 Rome, Italy. This work was supported by the REACH HIGH Scholars Programme—Post-Doctoral Grants. The grant is part-financed by the European Union, Operational Programme II—Cohesion Policy 2014–2020 Investing in human capital to create more opportunities and promote the wellbeing of society-European Social Fund. Dreyfuss T, Cassar J. The performance of an induced calcium oxalate surface on Globigerina limestone. Paper presented at the 12th international congress on the deterioration and conservation of stone, New York, USA, October 24; 2012. http://iscs.icomos.org/pdf-files/NewYorkConf/dreycass.pdf. Accessed 17 Jan 2019. Bugeja, J. Origins and history of Argotti Gardens. The sunday times of Malta, March 1; 2015. https://www.timesofmalta.com/articles/view/20150301/life-features/Origins-and-history-of-Argotti-Gardens.558361. Accessed 17 Jan 2019.